The best rated nuggets around town. 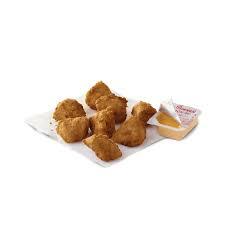 Many people adamantly believe Chick-fil-A has the superior nuggets. Chicken nuggets are one of the most popular fast food orders and are cheap, tasty, and easy to eat for everyone. There is always some debate about which of the top famous fast food restaurants serve the best nuggets for the price. McDonald’s and Wendy’s have always been big players in the chicken nuggets game, but Chick-fil-A has grown in popularity throughout the past several years. The competing companies offer new nugget deals and meals to keep people coming to buy their chicken nuggets, but people everywhere have very different opinions on the ranking. Wendy’s is also a big nugget contender and they also have several meal deals and cheap items such as the popular 4 for 4 meal. Wendy’s nuggets have more breading than McDonald’s and taste fresher, according to a good number of fast food customers. Wendy’s nuggets are especially delicious when dipped in a vanilla or chocolate Wendy’s Frosty frozen treat. Ice cream and chicken may seem like an odd mix, but everything tastes better in a Frosty. The big chicken nugget competition used to be between Wendy’s and McDonald’s, the two big fast food superpowers. However, the times have changed, and Chick-fil-A is probably the best quality fast food chicken place around. Senior Haley Kravec states that “Chick-fil-A is the best hands down” and senior Egan Beauvais also agrees saying that “Chick-fil-A is the best at everything.” People often describe Chick-fil-A as a higher-level fast food restaurant because the food is so yummy, and it actually looks more like real chicken. Chick-fil-A is famous for their chicken sandwich, and the company claims to have invented the chicken sandwich as it is known today. They also sell their “hand-spun” milkshakes, the favorite of which by many people is the cookies and cream milkshake. Perhaps the greatest thing about nuggets at Chick-fil-A is Chick-fil-A sauce, a famous sauce that slightly resembles honey mustard but with a twist. Overall, as of currently the leader in the chicken nugget game is probably Chick-fil-A. The quality of chicken and the taste put it at the top of the list of fast food chicken places. Wendy’s can earn second because their nuggets are good for the price and they offer good food deals. McDonald’s is taking third place due to the inconsistency of their nuggets and the price is too expensive for a single order of nuggets of that caliber.